Looking for a formal black tie but don't want something too plain and boring? 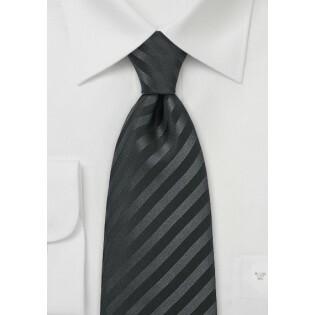 Then this black tie with subtle diagonal striped pattern will be perfect. It is a formal tie that combines a classic color with an elegant single-color striped design. 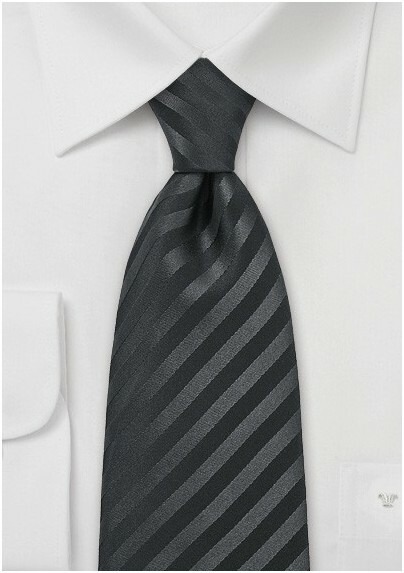 This tie looks best in combination with suits in the gray to black color range. Please note that this is a longer length necktie that has been made for the big and tall men. If you are taller than 6 foot 3 inches then you will know that a normal length tie is too short. This XL tie is 4 inches longer that even allows you to tie a larger double Windsor knot. Made from care-free microfiber.